We generally use the term ‘silverware’ when referring to spoons, forks, and knives, even when made from other materials. In popular folklore, a silver bullet is the preferred method for dispatching a pesky werewolf. Silver bullet also refers to a quick cure-all solution to a vexing problem. The French word for silver is ‘argent,’ which refers to the metal, as well as money, and it has its root in the Latin ‘argentum,’ its chemical element. Some of the most significant Roman pieces of silver were unearthed from a farmer’s field in England in the 1940s. These magnificent plates, spoons, and trays, known as the Mildenhall Hoard or Treasure, date mostly to 4 AD and the deep and intricate chasing shows the artistry and craftsmanship of master silversmiths. Decorated with leaf and animal motifs; the pleasure-loving gods, Pan and Bacchus; or Greek and Roman lettering, all were suitable for a princely get-together of food and merriment. 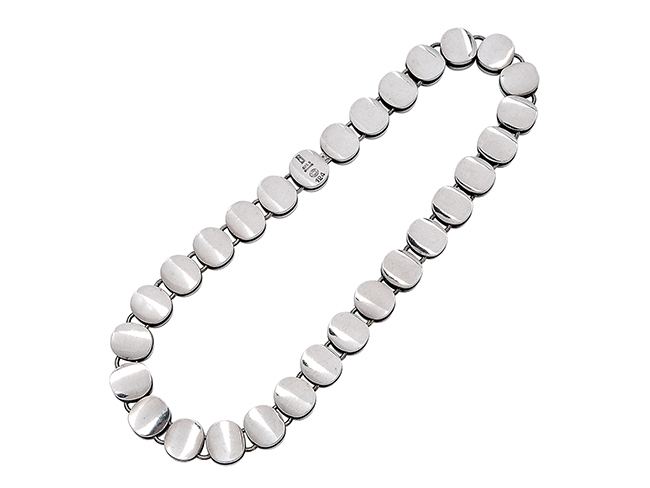 Sterling silver necklace by Georg Jensen. Silver is a versatile metal with endless uses, such as edible decorations for cakes and cupcakes, hammered into thin sheets as in silver leaf, ceremonial sword hilts, for medical and dental purposes, in photography prior to the digital age, and for the backings of antique mirrors. There’s a theory that in the earliest days of the movies, silver coatings were used on projection screens to improve their light-reflective qualities, hence the phrase ‘silver screen.’ Many types of electronics, such as computer keyboards and hearing aids contain silver and it’s in your LED TV, too. That quartz watch you’re wearing may even contain a battery coated with silver. Before the invention of antibiotics, ancient wisdom has it that silver concoctions were used to treat bacterial infections. In all sorts of competitions, silver has historically represented a second-place finish in medal rankings, behind gold and ahead of bronze. 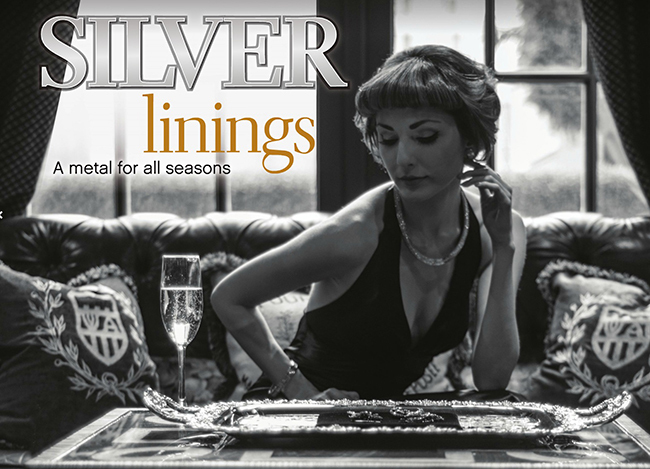 However, amongst prominent jewellery designers, silver is more than just an ‘also-ran.’ It often holds top spot in popular use with renown jewellers like Tiffany & Co’s. broad list of designers, including Elsa Peretti, Paloma Picasso, and Frank Gehry. Not a shabby group at all. And we mustn’t forget Scandinavia’s Georg Jensen and one of our own, Bill Reid, the late West Coast metal artist. Novice designers at the local community college often get their start using silver, since it’s an economical entry point for learning to use fine metals. Sterling silver ‘Atlas’ bangle, ring, and ear clips by Tiffany & Co. Sterling silver brooch by Georg Jensen. Doting Aunt Pippa Middleton didn‚Äôt just bronze a pair of booties for the christening of her nephew, Prince George. She had a studio cast in solid silver his adorable chubby little feet and hands at a purported cost of about $12,000. Not only has the prince been born with a ‚Äòsilver spoon in his mouth,‚Äô but he‚Äôll have sculptural evidence of his tiny limbs for perpetuity. That arbiter of all things proper and British, Debrett‚Äôs, notes that an expensive silver spoon was a must-have gift for all the best babies born in the mid-1500s Tudor era. 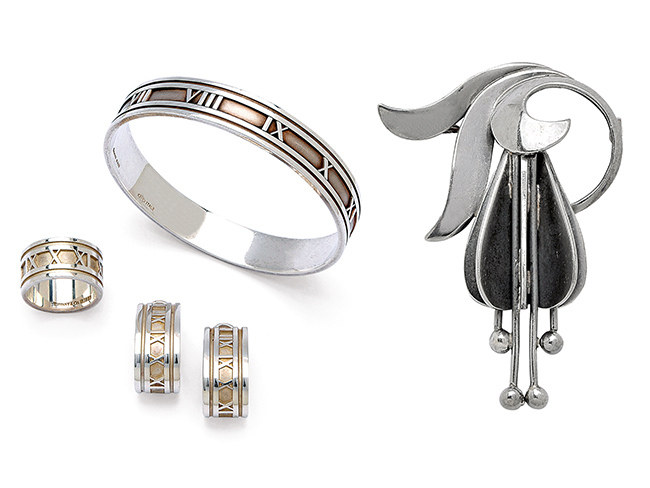 Top-tier high-end jewellers used silver prior to the invention of white gold; back then, an attractive blackened patina wasn‚Äôt considered a negative. The Georgians appreciated the versatility of various colours of paste, high lead-content glass simulating the look of diamonds, aquamarines, citrines, amethysts, etc., usually set in elaborate pendeloque styles, classic rivi√®res, or with grandly oversized stones. These designs were not only appreciated for how they mimicked actual gems, but for how their own intrinsic beauty was complemented by the colour of silver. Later during the 1880s, the Victorians fondly embraced the use of the paste mounted in silver in closed-back settings. Diamonds were also mounted in open-back settings to enhance their sparkle and whiteness. Pendants, brooches, necklaces, and earrings were commonly seen in silver-topped 14-karat gold, as were Edwardian-era items with garland and scroll motifs from around 1905. The complexities of the Texan Hunt brothers‚Äô attempts and machinations to control silver prices in the late 1970s and early 1980s confounded some of the best business minds of the day and still invites comments. At one point the billionaire brothers controlled half of all silver holdings worldwide. That figure increases to 77 per cent when you include silver futures, a complicated stock market venture dependent on a speculative rise, fall, and commodity shortage understood best by graduates holding MBAs. As long as the price of other metals remains high, silver‚Äìwith its myriad positive qualities‚Äìwill maintain its status as a fine choive for established and begineer designers everywhere.